Creating playlists in Spotify is great way to curate you own lists of songs for a particular event, situation, or mood. Not only does it allow you to create your own selection of songs, it can also be kind of fun to search for the perfect songs for the playlist that you are trying to cultivate. But musical interests can change over time, and your list of playlists can grow so much that it becomes difficult to manage. 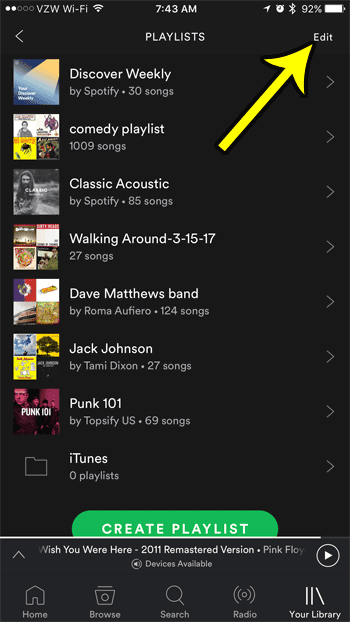 Fortunately you are able to delete Spotify playlists through the app on your iPhone. Our tutorial in this article will show you how. The steps in this article were performed on an iPhone 7 Plus in iOS 10.3.2. The Spotify app version being used was the most current version available at the time of this article. 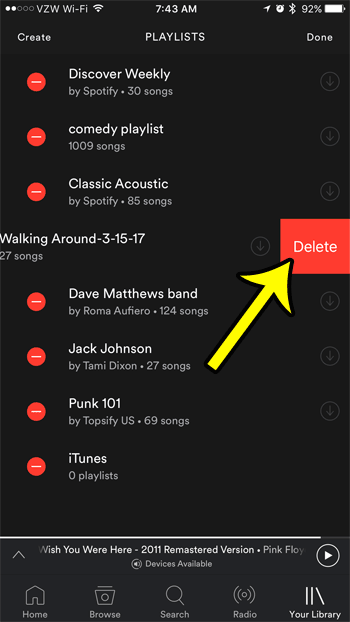 Note that deleting a playlist in this manner will delete that playlist from your account. So, for example, if you also listen to Spotify on your laptop or iPad, that playlist will also be gone from there. 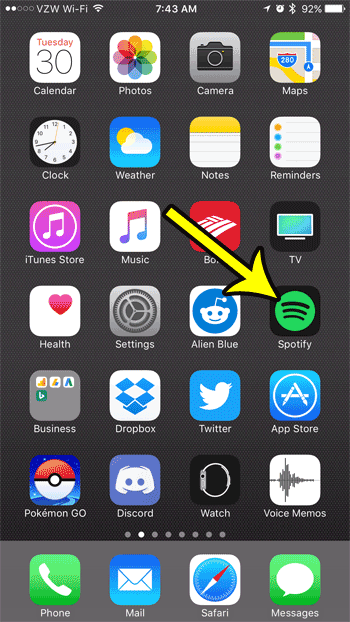 Step 1: Tap the Spotify icon to open the app. Step 2: Select the Your Library button at the bottom of the screen. Step 3: Touch the Playlists button. Step 4: Tap the Edit button at the top-right corner of the screen. Step 5: Select the red circle to the left of the playlist that you want to delete. Step 6: Touch the Delete button to remove the playlist from your account. Note that if the playlist you are removing is one that you are following, rather than one you created, then the button will say Stop Following rather than Delete. You can tap the Done button at the top of the screen when you have finished removing playlists. Are you going to be somewhere that has no cellular reception, or very poor cellular reception, but you would like to be able to listen to your Spotify music? 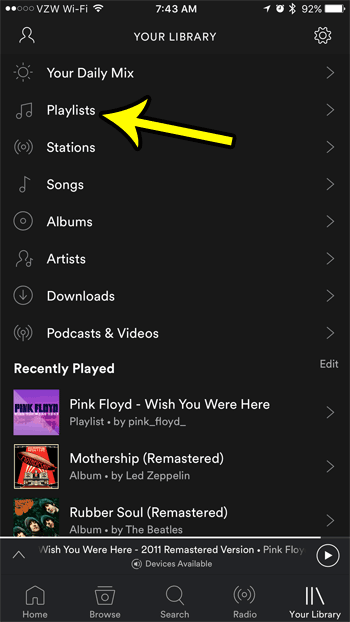 Learn how to make Spotify playlists available offline so that you don’t need an Internet connection to listen to them.